All up testing of DIY homemade telescope mount and first image! Following the successful mating of the large Newtonian to the homemade telescope mount, I decided to take things a step further. In the UK we are running out of darkness. From now until mid-August the stars do not come out until late in the evening and don't stay out for very long. 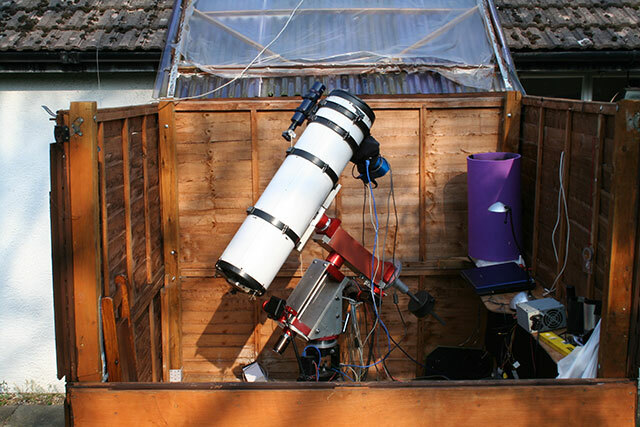 I'm hoping to start using the homemade telescope mount full time later this year, but this weekend, with clear skies and a few days holiday for Easter, is probably the last chance for an all up test of the system. So I decided to pop the new mount into the observatory for a complete test with camera and auto-guider and see what happened. After nearly killing myself lifting the thing into the observatory and mating it to the pier (the mount weights 30Kg) I got everything setup and waited for the stars to come out. This test was pretty important as it gave me a chance to find out all the niggles and snags in the homemade mount, and give me a chance to work on them over the next couple of months before I move the DIY mount into the observatory permanently. First of all the mount seemed to slew around the sky quite well - no problems with the full load of the scope and cameras. Given that my polar alignment is abysmal (I've not polar aligned anything for 5 years - out of practise!) GOTO worked remarkably well. I was able to sync the GOTO to a Alkaid at the end of the Plough, and goto M51 and get it onto the sensor of the CCD camera. So far so good, but what about guiding? Disappointingly I didn't have a good guidestar anywhere near M51 in the homemade OAG (who wants to image galaxies anyhow! 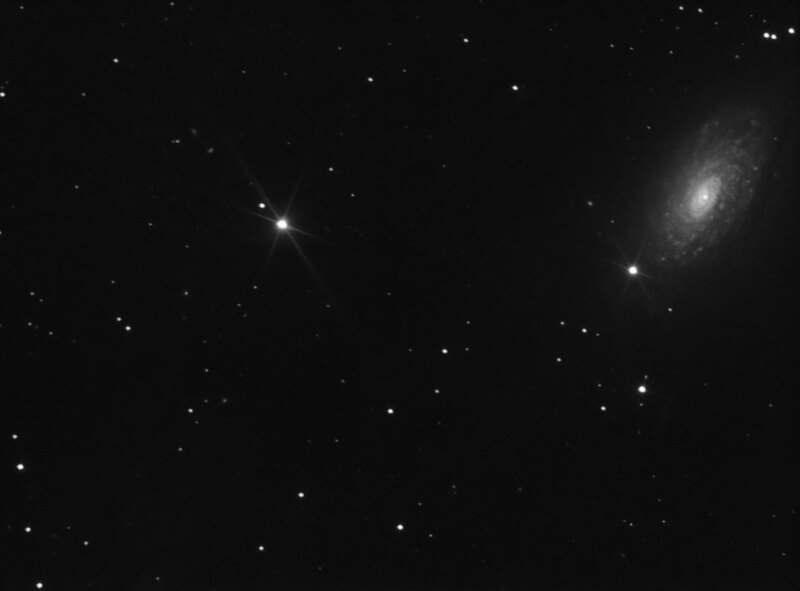 ), so I travelled a bit further to M63 and picked up a good guidestar with M63 just on the edge of the frame. Parts of the sky which contain galaxies do not, as a rule, contain many useful guidestars. Guidedog started working on the guidestar and the Artemis 285 CCD camera started firing off 3 minute exposures. The RA guiding seemed ok - rarely recording errors much more than about 1.5 arc seconds, and the occasional glitch. Due to the dreadful polar alignment, the drift in DEC was huge in this part of the sky - something lie half an arc minute per minute, so the DEC guiding was working overtime. The resulting image has got the stars egging slightly in DEC - although this is hard to tell in the image below due to my esoteric camera angle. DEC runs roughly 10 o'clock to 4 o'clock on the image. After tweaking around with the guiding parameters I decided this wasn't an entirely fair test due to the massive drift in DEC, however it highlighted that things could be tightened a little in the DEC axis of the mount so reduce sudden guiding jerks as the slack in the gears is taken up, but considering the drift I'm happy. All the remained was to leave it running for a while. It behaved itself well - so I left it to gather 20 x 3min frames of the region. Below M63 there are some photos of the mount in the observatory - I have to go and lift it back indoors now! As an added bonus, whilst sitting in the observatory I watched the ISS float over! A massive step forwards for the DIY homemade equatorial telescope mount project - putting the big scope on it! For many years I've imaged with my F5 8 inch newtonian reflector on my LXD55 mount. A poor mount - but I made it work. The new homemade telescope mount is obvisouly designed to be a step forwards, and this summer is going to see the new mount in the observatory. I've been testing the new GEM equatorial telescope mount with my small achomatic 400mm FL refractor on a tripod, but today I stripped down the main imaging rig and brought the 8 Inch Newtonian indoor for probably the first time in three years! Some adjustments to the dovetail bar and I had the big heavy Newtonian firmly attached to the homemade mount - and I'm pleased to say everything worked ok! As you can imagine this is a rather terrifying experience - the first time I've trusted the big scope on something so, ahem, homemade! The motors drove the load quite happily, and I was pleased to be able to shorten the counterweight bar by about 8 inches - so it will now fit in the observatory. By adjusting the clutches I was able to move the mount around on the mount with enough friction to hold it in position - this means if I run the mount into the pier, it will just slid on the clutches instead of something more terrible happening! I've put the DIY homemade GEM telescope mount back together after improving the mounting of the motor output shaft and done another indoor GOTO slewing video. 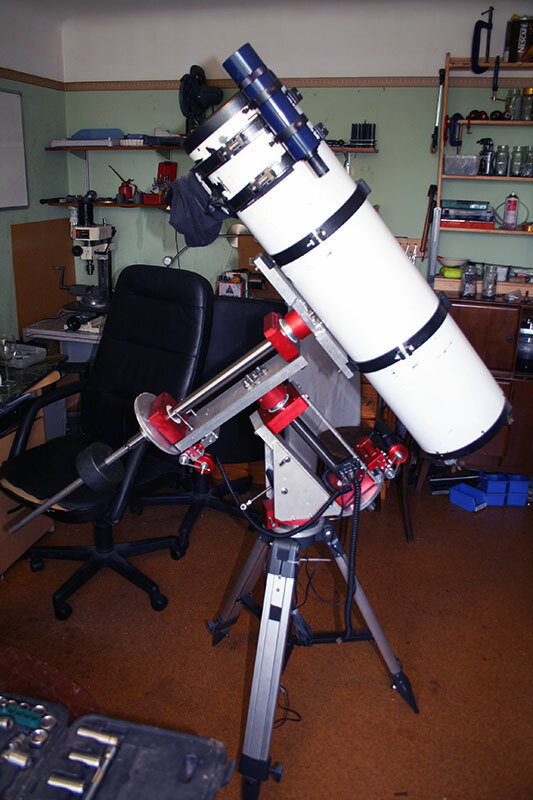 The mount is run from a Meade Autostar DS motor kit. 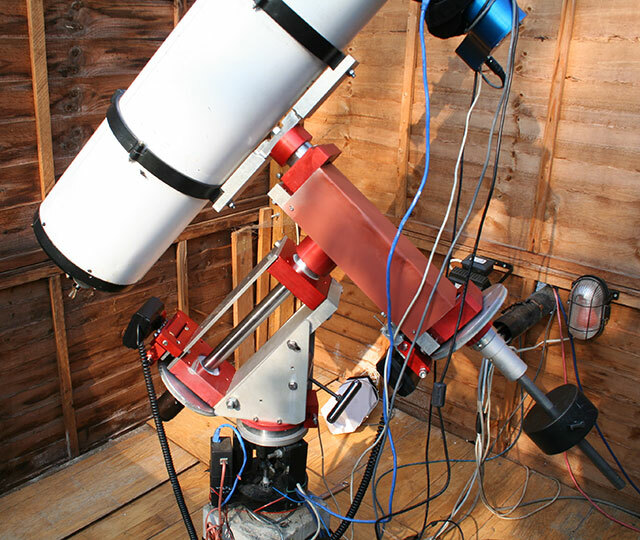 These motors are designed to run a much smaller telescope, but can be adapted to run a much larger telescope mount because the Autostar controller lets you program in the ratio of the worm gears. A consequence of this means the slewing is very slow - but it gets to the target in a few minutes, and I can wait a few minutes as I normally only image one or two targets a night. The noise is still pretty dire, but sounds much more healthy than my previous video due to the better mounting. Tomorrow, if it says clear, I will take the mount outside for some real GOTO and PEC tests. If the PEC looks acceptable then I am on the home run - I just need to make some covers and other weatherproofing bits and bobs . Then we can move the new mount into the observatory shed. The main weatherproofing conerns are keeping the dirt off the worm wheels and gears, and protecting any of the mild steel parts. Most of the scope is made from stainless steel or aluminium but some parts (e.g. the shaft) are going to need some heavy grease and covers to prevent unsightly corrosion. Meade Telescopes did a great service to us crazy astronomers who like to build their own mounts when they produced the Autostar DS motors. The system consists of two black plastic motor boxes containing the electric motor, various electronics, and a reduction gearbox. There is a central plug board into which you connect the two motors, the power and the handset. The power requirement is 12v (I use a PC power supply) and the handset is the Autostar 497 controller - the same one I use on my LXD55 mount. There are two major advantages to the Meade DS motors. First, it is physically quite straighfoward to engineer something to fix the motors onto any type of DIY mount. Secondly, it is possible to adjust the speed settings in the Autostar 497 controller. 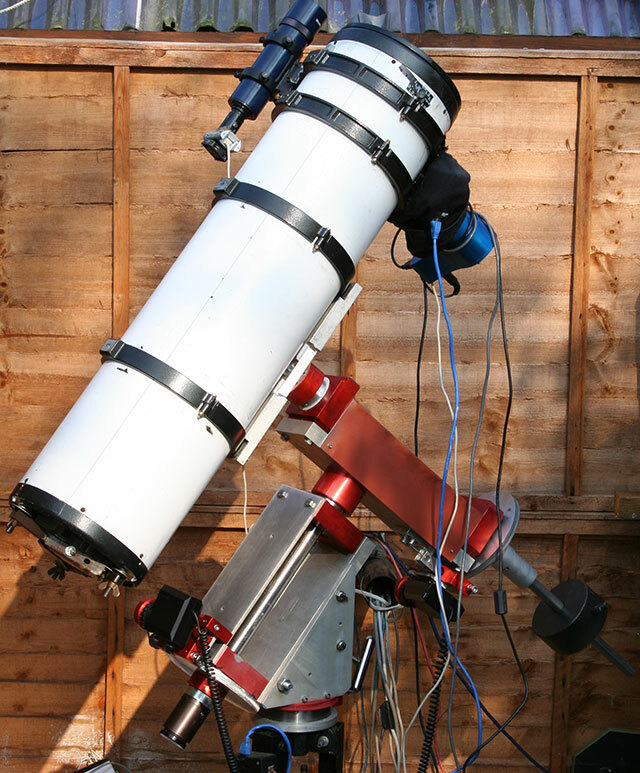 All telescope mounts have large reduction gears external to the motor gearbox - usually a worm-wheel and gear arrangement. 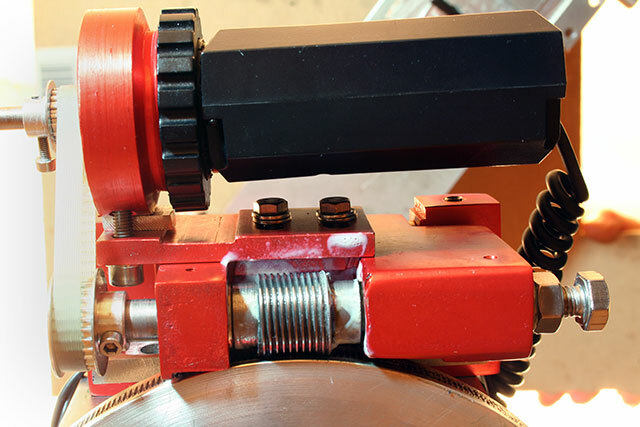 This converts the fast electric motor to a the very slow speed / high torque drive requirements of a telescope mount. Depending on the various tooth counts and ratios of the worm gears, you have adjust the motor speed specific to your setup. A large worm gear means the motor must go faster to keep up with the sky than with a small worm gear. It is up to the motor controller (the handset) to calculate the correct motor speed, and the joy of the Autostar 497 controller is that you can effectively tell it the size of your worm wheel reduction - meaning the motors can be used to run more or less any mount. The added benefit: Once you've told Autostar about your mount, all the GOTO and autoguiding features will also work. The real trick is mounting the motors properly on your homemade telescope mount. Most mounts are driven using a worm gear that turns a large worm wheel. The worm gear, which is usually 10-20mm in diameter needs to be driven by the motor output shaft. One option is to directly couple the motor output shaft to the worm gear - however, this is rather unstable and impractical. It is much neater and more effective to use gears or timing belts/pulleys to transfer the drive from the motor output shaft to the worm gear. I use timing pulleys and belts as they are easier to tension and get correctly adjusted than toothed gears. 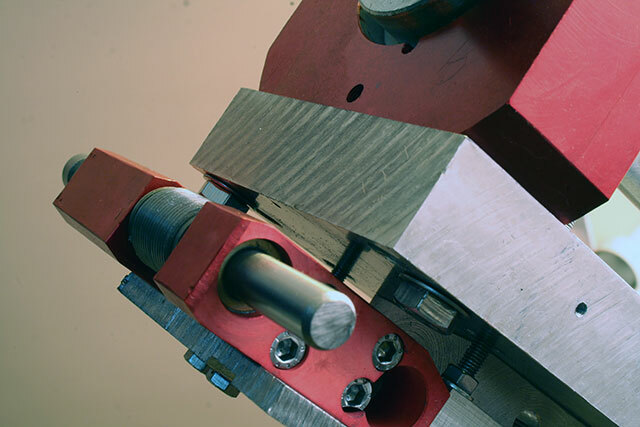 The key to a successful implementation of DS motors on a telescope mount comes down to ensuring both the worm gear and motor shaft are rigidly fixed with respect to each other. Unless both the motor output shaft and the worm gear are properly mounted with bearings and bushes, there is a chance of things bending and flexing - resulting in serious tracking errors at the telescope end. For example, if the distance between the worm gear and motor output shaft on my mount changes about a millimetre during the course of one rotation, that translates into several tens of arc seconds error in tracking - an unnessecary cause of periodic error. 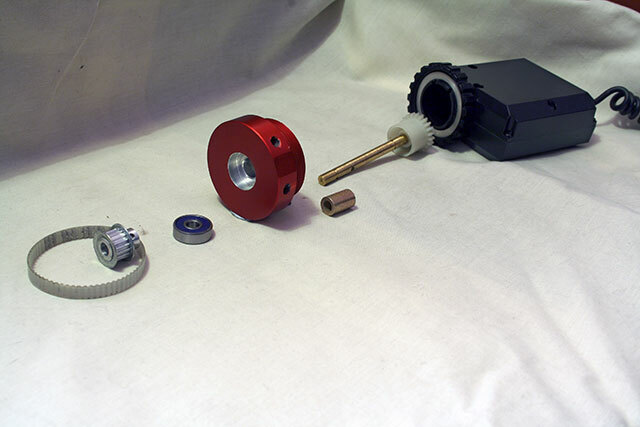 The images below show the parts I have made to connect my Meade Autostar DS motors to my telescope mount. The first picture here shows the motor on the RA axis attached to the mount. The second picture here shows a breakdown of the parts. I have made an anodised red round aluminium insert. This insert can be bolted to the worm gear block on the mount, and it has a thread onto which I can screw the Meade DS motor. The motor output shaft runs through the middle of this block supported by a bearing at one and and a bronze bush at the other end. This picture shows the worm gear itself - mounted between two bronze bushes and spring loaded against the worm wheel. The motor is bolted to the sprung section. Another visit to the New Forest Observatory, this time for some hard work. Greg has started work on his second observatory dome in his back garden. Last week he cut the turf and dug the 3 foot deep 20"x20" hole for the concrete base for his pier. I don't know anything about concrete, and Greg knows slightly less, so in the spirit of Douglas Adams "Fine we'll do it together." I did do the concrete for my pier years ago, but that is about the limit of my experience. However, Greg's shiny new yellow cement mixer (very Vogon) made short work of it, and things progressed far more quickly than either of us expected. Many wheel-barrow loads of sand and gravel and about 4x25kg sacks of cement later we have a fairly respectable looking pier base sticking about a foot out of the ground. Greg's next job is the wooden decking upon which sits the dome. I'm keeping well away - bad things happen to woodwork when I'm around!